WBO female Minimumweight champion Kumiko Seeser Ikehara (7-1-2, 3) made the second successful defense of her title earlier today as she took a split technical decision against veteran Kayoko Ebata (8-6, 4). Sadly, much like Ikehara's first defense, this bout ended with the champion having a nasty cut and bringing an early conclusion to what was an exciting looking contest. From the opening round this bout was engaging with both fighters giving their all and being competitive with each other from the opening bell. Ikehara seemed to have the edge in power whilst Ebata seemed the speedier, but there was little to distinguish the two who were really putting on a show early on. It seemed that every time one fighter had some success the other would fire back and have some of their own. It was competitive and exciting. Then, suddenly and unfortunately, the bout came to an end with both fighters being cut badly from a headclash. Although both were cut Ikehara certainly ended up with the worst of it and it was her cut that caused the early conclusion to the action. The competitiveness of the contest made the arena tense as we awaited for the cards which read 67-66, 67-66 and 66-67 giving Ikehara the narrowest of narrow decision wins. Teenage world champions don't come around often but today saw one crowned as Japanese 19 year old Mako Yamada (7-0, 2) travelled to South Korea and dethroned the previously unbeaten Su-Yun Hong (9-1, 5) of the WBO female Minimumweight title. 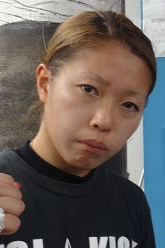 Yamada may have come in to the ring as a novice boxer but she had had serious experience in both kick boxing, where she was a stand out, and in sparring, which she had been doing with the sensational Momo Koseki. Despite that experience we had still expected her to come up short, away from home, to Hong. Instead of coming up short Yamada came of age in a performance that could only be described as inspired. The challenger, fighting in her first championship bout, hardly looked like a novice and she hardly looked like a fighter in unfamiliar surroundings. She seemed to know that she had to show off her skills if she was to pick up the title and despite the crowd being against her she didn't look like a fighter intimidated as she showed off what talent she had. Hong, to her credit, seemed to know she was in a real fight and tried to control the bout with her southpaw jab and over-all size advantage. Unfortunately for the defending champion she was fighting someone who was quicker than her, more aggressive than her and who was unwilling to go home with out the title. Yamada's speed, both hand and feet, made life very hard for Hong who seemed unable to time the challenger. Although highly impressive Yamada, like every fighter when they fight away from home was clearly worried about the scorecards. She looked like she knew she deserved the victory but it was until the referee raised her hand that she knew she was the champion. The worry about the judging was right to be on the mind of Yamada, especially after the decision was read as a split with scores of 97-93, 96-94 and a very odd 96-97 (yes 3 rounds scored 10-10). Thankfully though 2 of the judges did manage to get the right winner and helped crowned the new champion. An emotional Yamada celebrated her victory whilst Hong, who seemed to know she had been beaten, looked happy that the fight as over. Now with the title around her waist it could be a very long time until Yamada is beaten. We had thought this fight was coming too soon for her, though with the way she coped with the 10 round distance would suggest that she is a sensational little fighter who is only going to get better. As an after note Yamada became the first ever Japanese female teenager to win a world title, showing just how promising she really is. On this same card we also saw the previously win-less Bo-Ra Kim (1-2, 1) stopping the debuting Da-Eun Hong (0-1) in 3 rounds. This victory for Kim has come after back-to-back losses to Eun-Sun Lee, the second of which was rather controversial.